"Yeah, let's have a bachelor party with chicks and guns and firetrucks and hookers and booze!!" The 1980s certainly housed a lot of brash, tasteless comedies. Of course, the trend is sort of coming back, but in a way, it's hard to top all the stuff that came before since there's so few ways left to shock audiences. 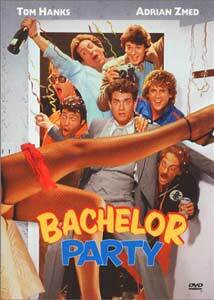 Certainly one of the 80s standards is Bachelor Party, and Tom Hanks' finest moment as well. Sure, Hanks legitimized himself with films like Philadelphia, Forrest Gump, and similar, character driven roles, but alas, we tire of his emotional turmoils year after year, and long the simplicity of Hanks earlier work. Don't we? The set-up is fairly simple and rather textbook: Rick (Tom Hanks) is marrying Debbie (Tawny Kitaen). Debbie, however, suspects that maybe Rick's bachelor party will go a bit overboard and he might cheat on her. Meanwhile, Debbie's ex-boyfriend Cole (Robert Prescott) tries to make the situation worse by trying to make Debbie think that, indeed, Rick is involved in cheating and other shady things. It turns out that Rick's friends are planning a part far beyond his expectations, and it will be something as sleazy and bizarre as possible. Prostitutes, drugs, donkeys, and a neurotic, suicidal party guest are really only the tip of the iceberg. To be sure, though, Bachelor Party manages to rise itself up a bit from the rest of the "wild night" films produced in the day. It's genuinely funny at moments and even though it may be at the expense of political incorrectness, it's still hard to feel guilty about laughing. I'll grant some of the humor is pretty foul and immature, but it's inescapably funny. I think the central reason for this is the brilliant touch of making Rick a genuinely 'nice guy' character. He doesn't want to cheat on his bride-to-be, and although he's given ample opportunity to completely erode the last inkling of morals he has, he refuses and stays the course. This makes Bachelor Party much more admirable as a goofy, wild comedy than many of its equals, because there actually IS an underlying message that good guys can have fun, but still keep their integrity. Hanks was really at his comedic prime at about this time, but his co-workers on this project firmly place the movie in the mid-1980s without question. Forgotten faces like Adrian Zmed, Michael Dudikoff (who went on to the American Ninja franchise), and Wendy Jo Sperber make for an experience that's both nostalgic and creepy at the same time. Sperber, of course, was one of Hanks' co-stars on the now-unspoken television hit, Bosom Buddies. There's a lot of other great faces from past comedy, and they all sort of mix together in a weird haze of humor that feels very old, but yet, still effective. Certainly there are writers and directors trying to revive this breed of comedy for modern audiences (for example, the somewhat similar Saving Silverman released only a few months ago), but there's no way you can top a classic like Bachelor Party. It's stupid, but it can get away with being stupid perfectly well, and there are no pretensions otherwise. This is certainly a guilty pleasure for most people, I would imagine, and I can see why. Instead of spending your clams on Cast Away, why not enjoy the finely nuanced, atmospheric humor of Bachelor Party? You know you want to. Image Transfer Review: Bachelor Party fans are in for a treat with a very nice, smooth, anamorphic transfer. Although a few sections have some noticeable grain, the vast majority of the film is extremely sharp and well rendered. A quality source print must have been used as damage and speckles are absent, and all your favorite, sick scenes are now available in digital clarity. Colors are nicely improved and brightened; given new sheen, with good balance of black level. Very satisfying and high quality. Audio Transfer Review: The new Dolby 4.0 mix on the disc is a nice, subtle upgrade of the original mono sound. There is no use of the surround channels, but most of the music and broad audio in the film are presented in stereo, with dialogue rooted in the center channel. It isn't mind-blowing, but it sounds nice and wraps the room up well with a good soundstage. The original mono is presented and is basically what you'd expect from a fair-quality mono mix. The 4.0 is much more worth it, unless you want the French audio mono. Extras Review: I would have never expected extras on a disc like this, but Fox actually included some promotional video shorts from 1984 that make for an interesting time capsule. Although split up and called different things, there's basically 6 featurettes, each of which features different clips of interviews with the actors, writers, producers, and director. A few of them focus mainly on Tom Hanks, but overall, they're just standard television promotional material. They're not very good quality, but they certainly are fine for what they're supposed to be. The original trailer is present (oddly cropped and widescreened to 2:35:1 and non-anamorphic). This was a preview screener, so there was a lack of inserts and such, but I will say that I really applaud Fox's decision to keep the original Bachelor Party cover artwork. With his stardom nowadays, you'd think they might have downplayed the film with a cover that made Hanks look nicer or take up more room on the marquee, but it's the same old artwork from the posters and VHS release. Fox does a pretty good job of bringing this comedy classic home in good condition. The extras are nothing special, but the fact they're there shows some nice commitment to the medium. Fans of the movie (and you know who you are) should really pick this disc up.